Yokota Air Base (横田飛行場, Yokota Hikōjō? 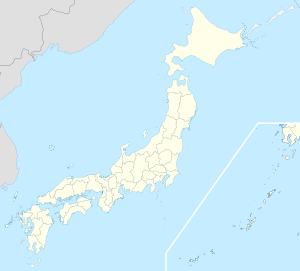 ), (IATA: OKO, ICAO: RJTY) is a United States Air Force base in the city of Fussa, one of 26 cities in the Tama Area, or Western Tokyo. The base houses 14,000 personnel. The base occupies a total area of 136,413 m2 (1,468,340 sq ft) and has a 3,353 m × 61 m (11,001 ft × 200 ft) runway. Among its facilities are the broadcast center for the American Forces Network Tokyo radio service and a detachment of PACAF's Band of the Pacific. It is not uncommon to see a C-5, KC-10, DC-8, C-17, L-100, civilian charter airline aircraft (Omni International, North American Airlines, World Airways, Ryan International, etc.) and cargo 747s on the Transient Aircraft ramp. The 374th Maintenance Group maintains C-130H1, C-12 and UH-1N aircraft supporting intratheater airlift and distinguished visitor transport for Pacific Air Forces. The Civil Air Patrol's Yokota Cadet Squadron conducts operations at Yokota Air Base. The newly renovated Air Mobility Command (AMC) Passenger Terminal is on the main part of the base next to the flightline. It is a 5- to 7-minute walk from the Kanto Lodge (see below) and offers Space-Available flights to various destinations in PACAF such as Alaska, Guam, Hawaii, Korea, Okinawa, Singapore, as well as the Contiguous United States. The facility which houses Yokota Air Base was originally constructed by the Imperial Japanese Army in 1940 as Tama Airfield, and used as a flight test center. During World War II Yokota became the center of Japanese Army Air Forces flight test activities and the base was the site of the first meeting between Japanese and Italian wartime allies. Tama was first identified by United States military forces in November 1944 by a 3d Reconnaissance Squadron F-13 Superfortress photo-reconnaissance aircraft, flying from Tinian in the Marianas. It was identified as being associated with a nearby Musashino-Nakajima aircraft manufacturing plant. Along with the Showa Air Base to the northwest, and Tachikawa Air Base to the east, it was compared to the aircraft development complex of the USAAF Wright-Paterson Field in Ohio. According to the USAAF intelligence at the time, the three bases conducted all IJA flight testing. In the spring of 1945, XXI Bomber Command attacked the base eight times along with the aircraft manufacturing plant, but each time heavy clouds forced the bombers to attack secondary targets. The Nakajima plant was finally attacked in April 1945, but the Tarma airfield never was bombed. With the end of hostilities and the Japanese surrender in September 1945, a detachment of the United States Army 1st Cavalry Division arrived at the base on 4 September. The airfield's buildings were largely intact, and some 280 of the IJA's most modern aircraft were discovered in hangars. The 1st Cav named the facility Fussa Army Airfield, then renamed it Yokota Army Airfield at the end of September. The initial USAAF use for the base was for airlift operations when the 2d Combat Cargo Group arrived with four C-47 Skytrain squadrons. When the old runway deteriorated under heavy usage, the runway was repaired and Yokota supported operations of the Douglas A-26 Invader-equipped 3d Bombardment Group by August 1946. Additional construction during the 1940s and 1950s was completed and the base reached its current size around 1960. Inactivated and personnel, mission and equipment transferred to 339th Fighter Squadron (347th Fighter Group) with F-82F/G Twin Mustangs at Nagoya AB Japan. Flew Lockheed F-80Cs on air defense missions. Deployed squadrons from Spokane AAFld (later, Fairchild AFB), Washington. Flew B-29 Bombing missions over North Korea. Group, then Wing deployed from Spokane AAFld (later, Fairchild AFB), Washington. Flew B-29 Bombing missions over North Korea. Two after arriving at Yokota, the squadrons a bomb mission against marshalling yards at Pyongyang, North Korea. The 98th BG engaged primarily in interdiction of enemy communications centers but also supported UN ground forces. Interdiction targets included marshalling yards, oil centers, rail facilities, bridges, roads, troop concentrations, airfields, and military installations. In fact, the 56th was first the 56th Strategic Recon Squadron. It became the 56th WRS later. And, for several years the only aircraft were modified B-29s. About 1956 the B-29's began to be replaced with B-50's, and the unit continued to fly two missions a day, plus flying into any typhoons in the South Pacific. In 1956 the 56th lost a plane coming back from a mission, as it crashed into a hill not far from the base. All on board were killed. With the hostilities in Korea ending in 1953, Yokota Air Base returned to a peacetime Cold War status. Two major wings were stationed at the base during the 1950s, the 67th Reconnaissance Wing (1956–60) flying RF-80s, RF-84s and lastly RF-101s. The 35th Fighter-Interceptor Wing (1954–57) flew F-86 Sabres from the base. A Tactical Air Command air refueling unit, the 421st Air Refueling Squadron Flew KB-29s,and later KB-50Js from Yokota from 1953-65. All of these units were under the command of the 41st Air Division. The 35th TFW was reassigned in 1957 and the 67th TRW in 1960. Worldwide DOD Budget restrictions in the late 1950s caused several PACAF wings based in Japan to be reassigned or inactivated. These tactical fighter units were replaced by the Martin B-57 equipped 3rd Bombardment Wing where it trained in bombardment, reconnaissance and aerial refueling operations. The Air Defense Command 40th Fighter-Interceptor Squadron (December 1961 - May 1962) equipped with the Convair F-102 Delta Dagger stood an air defense mission. The Vietnam War resulted in an increased combat and airlift aircraft presence at the base. Yokota was used for ferrying B-52s to Southeast Asia along with being a base for US-based deployed F-105 Tactical Fighter Squadrons (35th, 36th, 80th). The 610th Military Airlift Support Squadron (1966–78) was created by Military Airlift Command to service the large increase in transiting airlift. The 65th Military Airlift Support Group (1969–71) was a headquarters organization for MAC airlift support squadrons in the Pacific and Far East. The F-105 squadrons deployed frequently to USAF-operated bases in Thailand to fly combat missions over North and South Vietnam, and to South Korea for alert missions. Initially the fighter squadrons were under the command of the 41st Air Division, shortly after reassigned to the 6441st Tactical Fighter Wing, activated in April 1965 to control the F-105 squadrons after their parent organization, the 8th Tactical Fighter Wing, relocated to George Air Force Base, California, to become a McDonnell Douglas F-4 Phantom II unit. With the reassignment of the 347th Fighter Wing to Yokota in 1968, the 347th assumed responsibility for all tactical fighters until its reassignment to Kunsan AB, South Korea, in March 1971. In 1971, all combat squadrons were transferred to Kadena and Misawa Air Base and Yokota became a non-flying station hosted by the 475th Air Base Wing. The 475th had no numbered flying squadrons, but operated a few T-39 Saberliners and UH-1 helicopters, along with supporting transient MAC cargo and passenger aircraft. Assigned flying squadrons returned to Yokota in 1975 when the 345th Tactical Airlift Squadron was assigned with its C-130Es. Headquarters, Fifth Air Force was transferred to Yokota on November 11, 1974, being transferred from Fuchu AS, Japan. The Tokyo Metropolitan Government has advocated opening Yokota to civilian flights, as a method of relieving traffic at Haneda and Narita Airport. In April 2010 Colonel Frank Eppich, the United States Air Force commander of base, banned screenings of the film The Cove at the base theater. A base spokesman said that The Cove was banned because using a base venue to display the film could be seen as an endorsement of the film. The spokesman added, "We have a lot of issues with Japan...and anything done on an American base would be seen as an approval of that event." A.^ Assigned to 2143rd Air Weather Wing at Andersen AFB, Guam. Yokota has provided support for fighter, bomber, and military airlift operations, hosting B-26 Invader, B/RB-29 Superfortress, P/F-51 Mustang, KB-50J Aerial Tankers, F-94 Starfire, B/RB-57 Canberra, C-54 Skymaster, F-86D Sabre, F-102 Delta Dagger, McDonnell Douglas F-4D Phantom II, F-100 Super Sabre, F-105 Thunderchief, C-5 Galaxy, C-141 Starlifter, and C-130 Hercules units. Each year in August, Yokota Air Base opens the gates to the Japanese community for its annual Friendship Festival. For two days, local residents can learn about Yokota Air Base. Food and events are provided for all ages. Roughly 200,000 visitors show up each year, although non-Japanese visitors may be turned away from the gates for security reasons. Yokota Middle School: School Dedication Ceremony took place on 13 June 2000. YMS initial year began with only grades 7 and 8, with the upstairs specialty wing housing High School classes until construction modifications to YHS were competed. Class officially began August 2000. The base was the setting of Almost Transparent Blue, a best-selling novel written by Ryu Murakami and published in 1976 as well as the anime Blood the Last Vampire. Yokota Air Base and its surrounding area were the central location for the 2006 movie 2006 film. It is also the setting of parts of The Yokota Officers Club : A Novel by Sarah Bird. The base is also the birthplace of US Marine Captain, former UFC fighter and Fox Sports analyst Brian Stann.